Parisian women always give people an impression with good fashion sense, even with 111 rainy days a year, they will not give up their elegant styling, no matter on rainy or sunny days! This fall, AIGLE, a well-known outdoor lifestyle brand in France, collaborates with the icon of Parisian chic, the French women's fashion brand INES DE LA FRESSANGE to present the "AIGLE x INES DE LA FRESSANGE" capsule collection. This chic and comfortable rain kit, combines both functional protection and stylish design, in bringing you a perfect wardrobe for rainy days in a trendy look! The French fashion icon, INES DE LA FRESSANGE is recognized for her unique Parisian chic fashion style; AIGLE, the French rubber craftsmanship pioneer, has always been committed to promoting the connection between man and nature with a unique know-how whilst combining style and functionality. This season, the two brands join together to break the insulation between fashion and rainy days, and delivers a chic and comfortable raincoat outfit with protection but also staying feminine and stylish that all Parisian trendsetters emphasize on. 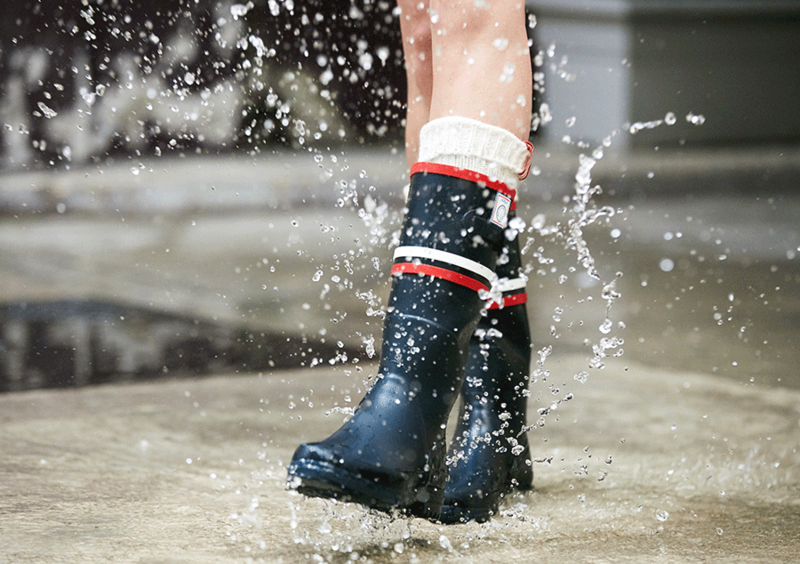 The “AIGLE x INES DE LA FRESSANGE” capsule collection will be exclusively available at ifc mall AIGLE store in Central on September 5th; the rubber boots will also be available in all AIGLE stores! The "AIGLE x INES DE LA FRESSANGE" collection is made up of French inspired with fresh and elegant colors in blue, white and red tones, including two fashion items that are loved by girls. Referencing from the military parka, the dark navy blue or chili red color INES COUPE PLUIE raincoat is made by MTD® waterproof, windproof and breathable fabric. Highlighted in blue, white and red ribbons with the touch of French elements, rubber touch buttons, and shirt sleeves, this coat represents AIGLE and INES’ uniqueness in all circumstances. Not only being lightweight and easy to care, this raincoat can also be folded away into a small pouch and slipped into your bag. For the rubber boots, the women’s INES BOTTILLON are applied on the classic CHANTEBELLE boots, inspired by the equestrian style with its horse riding cut to the slim up silhouette. All the natural rubber boots are handmade in France by AIGLE’s master rubber craftsmen in Châtellerault factory. Don’t let yourself be disarmed when the first raindrop begins to fall! This collaboration will give us a stylish raincoat look, make you fall in love with the raining days, and become an indispensable item in our wardrobe!